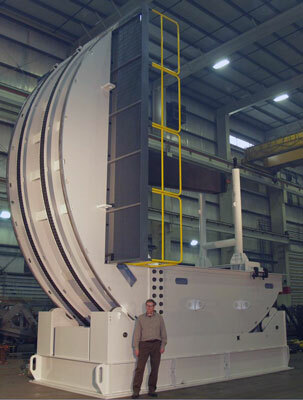 The upender is unique in that it must support a 110,000 lb transformer coil that rests on a cantilevered hanger that is bolted to the loading platform. “This creates a completely different force distribution from a normal upender and that really drove up the weight”, said project engineer Marty Schoenecker. All Bushman employees in front of the Mitsubishi upender. 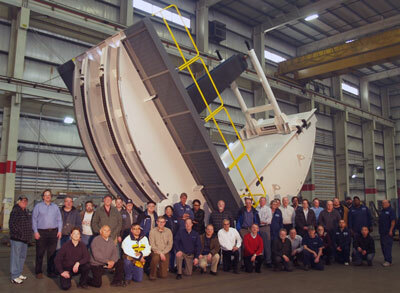 After Mitsubishi personnel visited Bushman to conduct and sign off on a successful Factory Acceptance Test, the upender was dismantled and a caravan of four flatbed semis delivered it to the plant site in Memphis. A Bushman subcontractor was on hand to reassemble the machine. The upender is over 28 ft tall when fully upright.